Happy 65th birthday, Mr. Magoo! On this day in animation history, the first Mr. Magoo cartoon, a Jolly Frolic called Ragtime Bear, was released by Columbia Pictures. 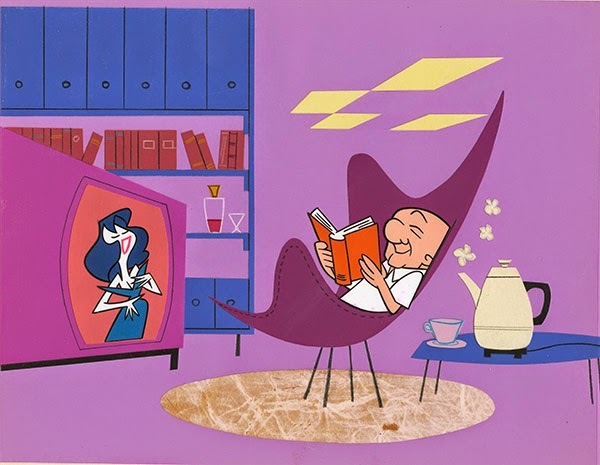 Written by Millard Kaufman, laid out by Bill Hurtz and directed by John Hubley, the short changed the fortunes of the nascent UPA studio and later created a merchandising bonanza for Hank Saperstein. You can see a model sheet from the original production right here on this blog from his birthday a few years ago. There were dozens of cartoons produced featuring the nearsighted Mr. Magoo, a feature, 1001 Arabian Nights, the first animated Christmas special, Mr. Magoo's Christmas Carol, and three separate animated television series: The Mr. Magoo Show, The Famous Adventures of Mr. Magoo and What's New, Mr. Magoo? Few people below the age of forty even know who Mr. Magoo was and it's safe to say that most anyone younger than that has never even seen a Mr. Magoo cartoon. Its unfortunate that Mr. Magoo was retired long before he turned 65 but here's hoping that another generation rediscovers him. Happy Birthday, Mr. Magoo! When you start digging into the history of animation, you never know what you'll find. 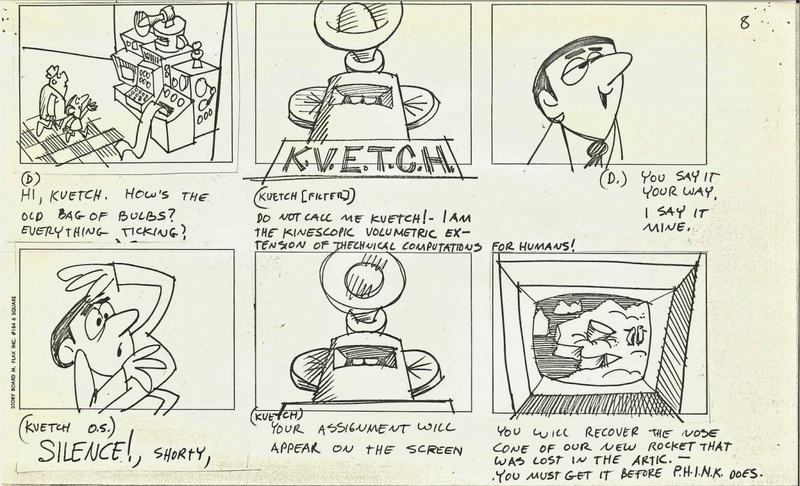 Lee Orgel's daughter, JoAnn, recently uncovered a few more items from her father's career, including a previously unknown animated pilot produced by Morey Amsterdam's previously unknown animation production company, JKL Productions. Those of you who have read my book will remember that Morey and Lee were good friends, which is why Morey did the French narrator in Lee's animated feature, Gay Purr-ee and a few lines in Mr. Magoo's Christmas Carol. It appears that Lee produced the pilot for Morey using Depatie-Freleng talent on the side. Mike Kazaleh has more on the short, as well as a transfer of the final film, at Jerry Beck's Cartoon Research. Be sure to check it out to see a rare artifact from a far corner of animation history. 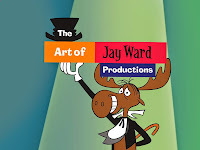 Marketing, promoting and selling The Art of Jay Ward Productions, that's where! 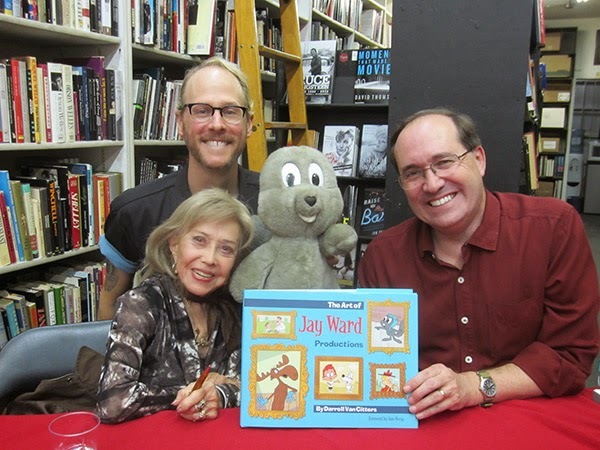 Most of the spring and early summer was spent making the rounds of the various LA animation studios with Ward artist Sam Clayberger in tow as well as several book signings with June Foray. We even had an evening at the Aero Theater in Santa Monica with Sam and Allan Burns, whom you may remember as the co-creator and co-producer on The Mary Tyler Moore Show. For those who haven't read the book, Allan's writing career really got started at Jay Ward before he moved into live action comedy writing. If you haven't yet purchased a copy of The Art of Jay Ward Productions and would like to, I have a limited number of artist signed copies. These are signed by the aforementioned Sam Clayberger and Art Diamond, who has declined to make public appearances at signings so his signature on the books is very rare. You can buy them here. And for those who've wondered what happened to my Mr. Magoo's Christmas Carol posts, I stopped because there didn't seem to be any more to say. However, a few weeks ago, some very interesting material surfaced, material that I wish I had had for the 50th anniversary of the book, which you can still buy here for a limited time. Stay tuned for an upcoming post revealing just what was discovered.